Abnormal uterine bleeding (AUB), an updated term for dysfunctional uterine bleeding (DUB), is classically defined as excessively heavy, prolonged, or frequent bleeding of uterine origin that is not caused by pregnancy or recognizable pelvic or systemic disease. [1, 2] It usually results from disordered functioning of the hypothalamic-pituitary-ovarian (HPO) axis and is often associated with anovulatory cycles. This classic definition highlights that anovulatory uterine bleeding (as part of the etiologic spectrum of AUB) is a diagnosis of exclusion. It has been suggested that the term DUB should be retired and that AUB, appropriately qualified as described above, should be used instead. However, a number of medical authors continue to use the term DUB. 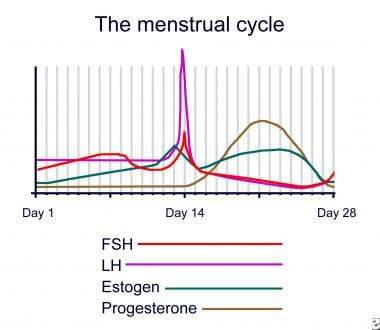 The normal menstrual cycle, characterized by sequential growth, maturation, and eventual sloughing of the endometrial mucosa, is produced by the cyclic release of estrogen and progesterone from the ovary. This occurs (orchestrated by the HPO axis) with amazing regularity throughout most of a woman's reproductive lifetime. During that first 14-day period, the endometrium, under the influence of estrogen, undergoes proliferation. The LH surge stimulates ovulation (on or about day 14) and conversion of the ovulatory follicle to a corpus luteum, which is responsible for estrogen and progesterone production. Under the influence of this progesterone, the endometrium is converted to a secretory state in preparation for implantation, if fertilization of the ovum should occur. Progesterone is produced only if ovulation occurs. As LH levels drop (on the assumption that fertilization and production of human chorionic gonadotropin [HCG] by the developing conceptus did not occur), the corpus luteum regresses, estrogen and progesterone levels plummet, and the endometrium deteriorates and is sloughed. The average menstrual cycle is 28-29 days (range, 21-35 days). Initially, some teenagers can have cycles as long as 45 days. Over time, the menstrual cycle becomes fairly consistent from month to month in any given woman. Normal menstrual flow lasts for 7 days or less and produces an average total blood loss of 25-69 mL. Women who experience (1) bleeding either more frequently than every 21 days or less frequently than every 45 days, (2) a menstrual flow longer than 7 days, and (3) blood loss exceeding 80 mL are considered to have abnormal menstrual cycles. With anovulation, estrogen levels rise as usual in the early phase of the cycle. In the absence of ovulation, a corpus luteum never forms, and progesterone is not produced. The endometrium moves into a hyperproliferative state, ultimately outgrowing its estrogen supply. This leads to irregular sloughing of the endometrium and excessive bleeding from spiral arteries that have not undergone physiologic senescence. International rates should reflect those seen in the US. In the United States, the average age of menarche is 12.3 years. In Canada and the United Kingdom, the average ages of menarche are 12.7 years and 12.9 years, respectively. [15, 16] Irregular and anovulatory cycles may persist for 1-5 years after menarche; however, regulation of menstrual periods typically occurs within 2 years. Race does not contribute significantly to the incidence of AUB. Overall, adolescents with AUB have an excellent prognosis, with most outgrowing the problem within 3-5 years of menarche. Compliant patients for whom oral contraceptive pills are prescribed rarely have recurrent episodes of AUB. For patients with AUB related to systemic disease, the prognosis depends upon the underlying disease process. Educate the patient and her caregivers about the normal menstrual cycle and the generally benign nature of AUB. Recommend recording a calendar history of menstrual cycles, noting the beginning and end dates of bleeding. Advise patients to return if they experience (1) bleeding more frequently than every 21 days or less frequently than every 45 days, (2) a menstrual flow longer than 7 days, and (3) overall blood loss exceeding 80 mL (~5 tbsp), or if they cannot comply with the prescribed outpatient treatment. For patient education resources, see the Women's Health Center, as well as Vaginal Bleeding, Amenorrhea, Anemia, and Painful Ovulation (Mittelschmerz). Bravender T, Emans SJ. Menstrual disorders. Dysfunctional uterine bleeding. Pediatr Clin North Am. 1999 Jun. 46(3):545-53, viii. [Medline]. Coupey SM, Ahlstrom P. Common menstrual disorders. Pediatr Clin North Am. 1989 Jun. 36(3):551-71. [Medline]. Behera MA, Price TM. Abnormal (dysfunctional) uterine bleeding. Medscape Drugs & Diseases. Available at http://emedicine.medscape.com/article/257007-overview. November 16, 2016; Accessed: April 13, 2017. Lavin C. Dysfunctional uterine bleeding in adolescents. Curr Opin Pediatr. 1996 Aug. 8(4):328-32. [Medline]. Strickland J, Gibson EJ, Levine SB. Dysfunctional uterine bleeding in adolescents. J Pediatr Adolesc Gynecol. 2006 Feb. 19(1):49-51. [Medline]. Estephan A, Sinert RH. Dysfunctional uterine bleeding in emergency medicine. Medscape Drugs & Diseases. Available at http://emedicine.medscape.com/article/795587-overview. November 15, 2016; Accessed: April 13, 2017. Munro MG, Critchley HO, Broder MS, Fraser IS. FIGO classification system (PALM-COEIN) for causes of abnormal uterine bleeding in nongravid women of reproductive age. Int J Gynaecol Obstet. 2011 Apr. 113(1):3-13. [Medline]. Mullins TL, Miller RJ, Mullins ES. Evaluation and Management of Adolescents with Abnormal Uterine Bleeding. Pediatr Ann. 2015 Sep. 44 (9):e218-22. [Medline]. [Full Text]. Collins J, Crosignani PG. Endometrial bleeding. Hum Reprod Update. 2007 Sep-Oct. 13(5):421-31. [Medline]. Austin SB, Ziyadeh NJ, Vohra S, et al. Irregular menses linked to vomiting in a nonclinical sample: findings from the National Eating Disorders Screening Program in high schools. J Adolesc Health. 2008 May. 42(5):450-7. [Medline]. [Full Text]. INDOX. Risk factors for breast cancer in India: an INDOX case-control study. INDOX Cancer Research Network. Available at http://www.indox.org.uk/research/epidemiology/casecontrol/breastcancer.html. 2010; Accessed: April 13, 2017. Anderson SE, Must A. Interpreting the continued decline in the average age at menarche: results from two nationally representative surveys of U.S. girls studied 10 years apart. J Pediatr. 2005 Dec. 147(6):753-60. [Medline]. Al-Sahab B, Ardern CI, Hamadeh MJ, Tamim H. Age at menarche in Canada: results from the National Longitudinal Survey of Children & Youth. BMC Public Health. 2010 Nov 28. 10:736. [Medline]. [Full Text]. Hamilton-Fairley D. Lecture Notes: Obstetrics and Gynaecology. 2nd ed. Oxford, UK: Blackwell; 2004. [Full Text]. Mikhail S, Kouides P. von Willebrand disease in the pediatric and adolescent population. J Pediatr Adolesc Gynecol. 2010 Dec. 23(6 Suppl):S3-10. [Medline]. James AH. Women and bleeding disorders. Haemophilia. 2010 Jul. 16 Suppl 5:160-7. [Medline]. Braverman PK, Breech L, Committee on Adolescence. American Academy of Pediatrics. Clinical report--gynecologic examination for adolescents in the pediatric office setting. Pediatrics. 2010 Sep. 126 (3):583-90. [Medline]. Meirow D, Rabinovici J, Katz D, Or R, Shufaro Y, Ben-Yehuda D. Prevention of severe menorrhagia in oncology patients with treatment-induced thrombocytopenia by luteinizing hormone-releasing hormone agonist and depo-medroxyprogesterone acetate. Cancer. 2006 Oct 1. 107(7):1634-41. [Medline]. Toth M, Patton DL, Esquenazi B, Shevchuk M, Thaler H, Divon M. Association between Chlamydia trachomatis and abnormal uterine bleeding. Am J Reprod Immunol. 2007 May. 57(5):361-6. [Medline]. Lee DY, Oh YK, Yoon BK, Choi D. Prevalence of hyperprolactinemia in adolescents and young women with menstruation-related problems. Am J Obstet Gynecol. 2012 Mar. 206(3):213.e1-5. [Medline]. [Guideline] National Heart Lung and Blood Institute (NHLBI). The diagnosis, evaluation and management of von Willebrand disease. National Institutes of Health. Available at https://www.nhlbi.nih.gov/files/docs/guidelines/vwd.pdf. February 2008; Accessed: April 13, 2017. Pecchioli Y, Oyewumi L, Allen LM, Kives S. The Utility of Routine Ultrasound in the Diagnosis and Management of Adolescents with Abnormal Uterine Bleeding. J Pediatr Adolesc Gynecol. 2017 Apr. 30 (2):239-242. [Medline]. [Guideline] Khati NJ, Glanc P, Bhosale PR, Harisinghani MG, Harris RD, Kim YB, et al. ACR Appropriateness Criteria® abnormal vaginal bleeding [online publication]. Reston, VA: American College of Radiology (ACR); 2014. 1-13. [Full Text]. [Guideline] Practice bulletin no. 136: management of abnormal uterine bleeding associated with ovulatory dysfunction. Obstet Gynecol. 2013 Jul. 122(1):176-85. [Medline]. Casablanca Y. Management of dysfunctional uterine bleeding. Obstet Gynecol Clin North Am. 2008 Jun. 35(2):219-34, viii. [Medline]. Stabinsky SA, Einstein M, Breen JL. Modern treatments of menorrhagia attributable to dysfunctional uterine bleeding. Obstet Gynecol Surv. 1999 Jan. 54(1):61-72. [Medline]. Kadir RA, Edlund M, Von Mackensen S. The impact of menstrual disorders on quality of life in women with inherited bleeding disorders. Haemophilia. 2010 Sep 1. 16(5):832-9. [Medline]. Rajput R, Dhuan J, Agarwal S, Gahlaut PS. Central venous sinus thrombosis in a young woman taking norethindrone acetate for dysfunctional uterine bleeding: case report and review of literature. J Obstet Gynaecol Can. 2008 Aug. 30(8):680-3. [Medline]. Gultekin M, Diribas K, Buru E, Gokceoglu MA. Role of a non-hormonal oral anti-fibrinolytic hemostatic agent (tranexamic acid) for management of patients with dysfunctional uterine bleeding. Clin Exp Obstet Gynecol. 2009. 36(3):163-5. [Medline]. Bs D, Nanda SK. The role of sevista in the management of dysfunctional uterine bleeding. J Clin Diagn Res. 2013 Jan. 7(1):132-4. [Medline]. [Full Text]. The authors and editors of Medscape Drugs & Diseases gratefully acknowledge the contributions of previous authors Tod C Aeby, MD, and LeighAnn C Frattarelli, MD, MPH, to the development and writing of this article.